More of the same. The War Diary for this day states, "Practised embarking and disembarking. I left (ie the author of the diary, possibly battalion OIC, Colonel Dobbin, ed.) 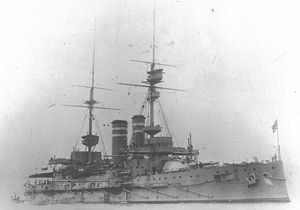 in HMS Queen to reconnoitre the shore of Gallipoli." Jack Reilly must have been too busy jumping in and out of boats. There is no contribution from him for the 13th. Charles Bean, however, the official historian, describes some of the events on this day, "On the afternoon of April 13th, the Queen (HMS Queen, not HMS Queen Elizabeth, ed.) sailed with the Staff, brigadiers and battalion commanders on board. After she had left port, Admiral Thursby explained to them the plans. 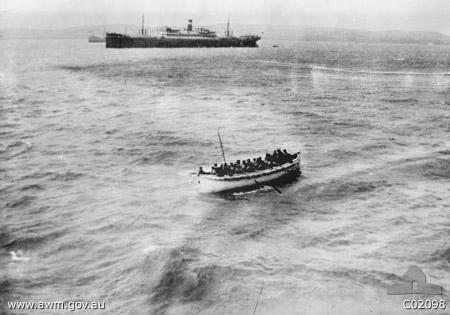 The ship steamed slowly through the night to the head of the Gulf of Saros, and next morning was moving at ten knots past a strange coast a mile and a half away. It was the Gallipoli Peninsula." It is perhaps worth noting at this stage that, throughout his diary, Jack Reilly was very thorough in mentioning the names of people with whom he comes into contact. In all, there are 38 people whose names he provides (excluding the famous such as Generals, etc). . I have been successful in tracing the fate of 37 of those names, thanks to the excellent records made available by the Australian War Memorial and the National Archives of Australia. Major Ross Campbell Dawson was a 34 year old accountant when he enlisted on 27 August 1914. Major Blair Inskip Swannell was an engineer and a veteran of the Boer War. 321 - Sgt Edward Rinnex Larkin was the 34 year old Member for Willoughby in the NSW Legislative Assembly. He enlisted on 21 August 1914. 134 - James William Adams was a 22 year old plumber when he enlisted on 22 August 1914. 188 – Geoffrey Ronald Lomas joined the 1st Battalion on the 1st September 1914. He was 19 years of age and had been working as a stockman. 201 – John Cairns was a 29 year old bookkeeper from Goondiwindi. He joined the 1st Battalion on the 4th of September 1914. 202 – David William Carter enlisted with the 1st Battalion on the 3rd of September 1915. He was 22 years of age and had been employed as a railway shunter. .
140 – Leslie James Billington was a 22 year old English boy when he joined the 1st Battalion on the 24th of August 1914. 178 – Allen Reginald Tindale was 19 years of age when he joined the 1st Battalion on the 1st of September 1914. Describing himself as a clerk when he enlisted. 179 - Harry Morell Reeve was a 20 year old shearer upon his enlistment in the 1st Battalion on the 1st of September 1914. 100 – Charles Lee was a horse driver and just 21 years of age when he joined the 1st Battalion on the 17th of August 1914. 189 - Sidney John Samson was 24 years old and a mechanic when he enlisted in the 1st Battalion in 1914. 1154 – Norman Byron Fraser joined A Company of the 1st Battalion on the 26th of August 1914. He was 19 years old, from Byron Bay and had been working as a clerk. 97 – Patrick Joseph Reilly (Jack's cousin) was a 37 year old platelayer from Bungendore when he enlisted in the 1st Battalion on the 17th of August 1914. 341 – Hector McKenzie was 28 and a Launch Proprietor when he joined A Company, 1st Battalion, on the 24th of August 1914. 127 – Samuel Weingott was 21 years of age when he enlisted on the 24th of August 1914. A tailor's cutter from Sydney when he joined the 1st Battalion. 1250 – Richard William Edwards was an engine driver who was born in Wales in 1880. He joined the 1st Battalion on the 22nd of October 1914. 94 – Sandoe Joseph Henry Dietze, AKA Joseph Henry Dietze and Joseph Henry Sandoe. He was born in Cornwall in 1894 as Joseph Henry Sandoe but due to his mother's remarriage early in his life, he preferred to be known by his stepfathers name of Dietze. He joined the 1st Battalion on the 17th of August 1914. This list serves to remind us that the Australian Army was made up of ordinary folk, people like you and I. They felt there was a job to do and they were about to do it. The cost was not considered.